Getting a great deal on tyres does not mean that you have to sacrifice safety or peace of mind. This is why ATS Euromaster now has a tyre clearance range including the most trusted brands at the best prices. All of our clearance tyres are new tyres. How can we offer such value for money? At ATS Euromaster we’re able to offer cheap tyres as a result of unfulfilled bookings, special buys, end of line products and surplus stock held by our Service Centre network. From Michelin to Continental, Pirelli to Goodyear, Dunlop, Avon or Hankook, our tyre clearance range offers cheap bargains from reputable brands. All tyre prices are inclusive of VAT, fitting, balancing and the disposal of your old tyres, so we promise that no hidden extra costs will be coming your way. How do I order clearance tyres? Step 1: Use the centre locator tool below to find your nearest Centre and see what clearance tyres they have available. Step 2: Contact your chosen Centre to check availability, reserve your chosen tyres and book an appointment. ATS Euromaster has a limited number of Tyre Clearance products available at certain ATS Euromaster Service Centres. These Tyre Clearance products are tyres which are available due to unfulfilled bookings, or they may be end of line products or they may be surplus stock at that Service Centre. In order to check stock availability and to arrange to purchase tyres, customers should contact the relevant ATS Euromaster Service Centre direct via the telephone number provided on the website. The Tyre Clearance prices are available on limited numbers of selected sizes and brands of tyres as stated on this website. Tyres of the same brand, size and pattern (so long as they have not been discontinued) may also be available at the Centre or another ATS Euromaster Service Centre. The ATS Euromaster Retail Centre Price List price will apply to those tyres. Please contact the Service Centre for details. Tyre Clearance products are available on a “first come, first served” basis. Tyre Clearance product availability is therefore subject to change on a continuing basis. The presence of a product on the website does not guarantee that such a product will be available for purchase. The ‘Usual Price’ refers to the fitted price for that product as set out in ATS Euromaster’s Online Price List at the time of, or immediately prior to, it being included on the website as a Tyre Clearance Product. Online prices may differ to ATS Euromaster's Retail Centre Price List. All Tyre Clearance prices shown on the website are in pounds sterling, are inclusive of VAT, are for a single tyre and include new valve, wheel balancing (these are mandatory) and disposal of your old tyres (if necessary). Tyre Clearance products are available to purchase in selected ATS Euromaster Service Centres only. Tyre Clearance products cannot be purchased online. All Tyre Clearance products must be fitted at an ATS Euromaster Service Centre. The Tyre Clearance products shown on the website are not available for collection without fitting. ATS Euromaster is unable to fit tyres to wheels which are not attached to a vehicle. Tyre Clearance products are subject to very limited availability. ATS Euromaster reserves the right to withdraw a product and to alter prices without prior notification and at any time. All Tyre Clearance products are sold under ATS Euromaster Terms and Conditions. We reserve the right to change these terms at any time. All product descriptions and illustrations shown on the website are provided in good faith but are intended for guidance and illustration purposes only and actual products may vary accordingly. No refund will be made if you do not require any of the elements of the fitting services. Tyre Clearance offers are available to Retail Customers in the UK only. 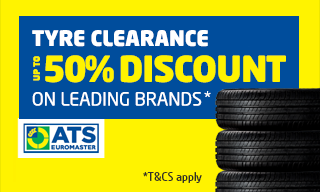 Tyre Clearance offers are not available to ATS Euromaster Business or Account Customer. Tyre Clearance products cannot be purchased in conjunction with any other promotion or discount. The ATS Euromaster staff purchase scheme cannot be used in relation to Tyre Clearance Products.